Synonyms: Marica plicata (Sw.) Ker Gawl., Bot. Mag. 18: t. 655 (1803), nom. illeg. Sisyrinchium bulbosum Mill., Gard. Dict. ed. 8: n.º 3 (1768). Bermudiana bulbosa (Mill.) Molina, Geogr. Nat. Hist. Chile 1: 113 (1809). Galatea bulbosa (Mill.) Britton, Brooklyn Bot. Gard. Mem. 1: 37 (1918). Sisyrinchium americanum (Aubl.) Lemée in ?. Ixia americana Aubl., Hist. Pl. Guiane 1: 33 (1775). Sisyrinchium latifolium Sw., Prodr. Veg. Ind. Occ. : 17 (1788). Sisyrinchium palmifolium Cav., Diss. 6: 348 (1788), nom. illeg. Ferraria parviflora Salisb., Prodr. Stirp. Chap. Allerton: 43 (1796). Sisyrinchium capitatum Pers., Syn. Pl. 1: 49 (1805). Sisyrinchium racemosum Pers., Syn. Pl. 1: 49 (1805). Galatea vespertina Salisb., Trans. Hort. Soc. London 1: 310 (1812), nom. nud. Antholyza meriana Blanco, Fl. Filip. : 24 (1837), nom. illeg. Eleutherine anomala Herb., Edwards's Bot. Reg. 29: t. 57 (1843). 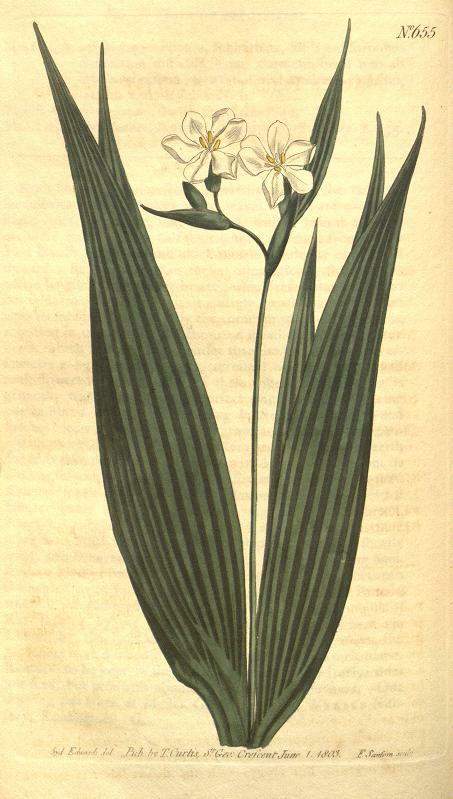 Sisyrinchium congestum Klatt, Linnaea 31: 98 (1861). Sisyrinchium elatum Seub. ex Klatt in C.F.P.von Martius & auct. suc. (eds. ), Fl. Bras. 3(1): 544 (1871). Sisyrinchium palmifolium var. congestum (Klatt) Baker, J. Linn. Soc., Bot. 16: 120 (1877). Bermudiana congesta (Klatt) Kuntze, Revis. Gen. Pl. 2: 699 (1891). Galatea americana (Aubl.) Kuntze, Revis. Gen. Pl. 2: 701 (1891). Eleutherine americana (Aubl.) Merr. ex K.Heyne, Nutt. Pl. Ned.-Ind., ed. 2, 1: 502 (1922). Eleutherine longifolia Gagnep. in H.Lecomte, Fl. Indo-Chine 6: 677 (1934). Eleutherine subaphylla Gagnep. in H.Lecomte, Fl. Indo-Chine 6: 676 (1934).